My parents are coming today so I'm supposed to be doing my last minute cleaning which means picking up all the crap I threw all over when I pretended to start deep cleaning. I have a really bad cleaning method that ends up with nothing getting done. I was talking to BJ and I saw the cat playing with something. THIS IS WHAT IT WAS! 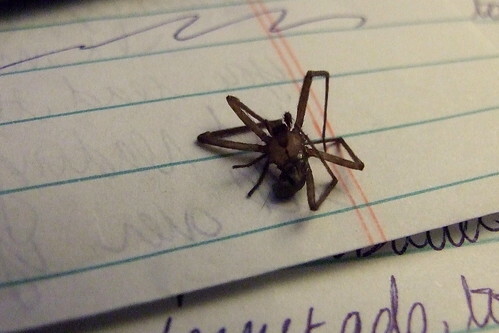 A FREAKING BROWN RECLUSE! So now I'm scared out of my mind to pick up all this crap I have all over the floor. And everywhere else. And don't even talk to me about sleep. I have no idea how that's going to happen. I feel like puking. Oh no. What if that means I've already been bitten?? ?